One of the most frequently asked questions by shooters pertains to the difference between our barrels with chrome lining and salt bath nitriding. Customers looking for a durable, reliable, and accurate barrel configuration are presented with both of these options and want to make an educated decision that will suit their individual build requirements. While either of these finish options can provide match grade accuracy, exceptional reliability, and extreme durability; both options incorporate their own unique traits and benefits. Chrome lining technology has existed for decades and has proven itself in battle in some of the most extreme climates and conditions found across the planet. There is no question of why a multitude of national militaries choose this method of bore and chamber treatment for their primary service rifles. Chrome lined barrels have long held an undeserved reputation for being inherently less accurate than barrels utilizing different finish techniques (or no finish at all). This is due to the traditional production methods typically utilized by manufacturers that greatly limits bore uniformity and finish. Traditional methods for chrome lining involve chemically pre-treating the bore, eroding the internal surface material to ensure adherence of the chrome lining. This method leaves much to be desired as it creates uneven material thickness and variance in bore dimensions throughout the full length of the barrel. Criterion chrome lined barrels utilize an entirely different method of chrome lining. Our proprietary approach serves to ensure optimal bore uniformity throughout the chrome lining process. Each chrome lined Criterion barrel is hand lapped and held to the same finish and uniformity requirements as our match grade stainless steel barrels. This chrome lining process produces a barrel that significantly increases durability through the more consistent and uniform application of the chrome lining while simultaneously offering national record-setting performance. Capable of generating sub-MOA groups with factory match ammunition and groups in the neighborhood of .5 MOA with handloads tailored to the individual barrel, Criterion is the only manufacturer in existence to offer a match-grade chrome lined AR-15 barrel. While chrome lining offers superior corrosion resistance to various external weather conditions, it also serves to significantly reduce throat erosion, allowing shooters to enjoy sub-MOA accuracy potential for as much as 20,000 rounds of normal use with factory match ammunition. This contrasts significantly with cold hammer forged mil-spec chrome lined rifle barrels, which are typically only required to successfully generate 4.5 MOA groups at 100 yards. Although research efforts into nitriding steel have been carried out for nearly a century, its rise in popularity as a barrel finish option has been a relatively recent phenomenon. Ferritic Nitrocarburizing is the thermochemical process that simultaneously diffuses nitrogen and carbon into the surface of ferrous metals. During the process, a two-part surface layer is formed, an outer iron nitride layer with a nitrogen diffusion layer below it. Nitrogen and carbon are absorbed by and diffused into the surface of the metal. Reproducible and uniform layers with a predetermined thickness will be formed on all areas of the metal. This process results in markedly improved surface properties on ferrous metal parts while maintaining dimensional and shape stability. One visible effect of the salt bath nitriding process involves the blackening of the surface material. 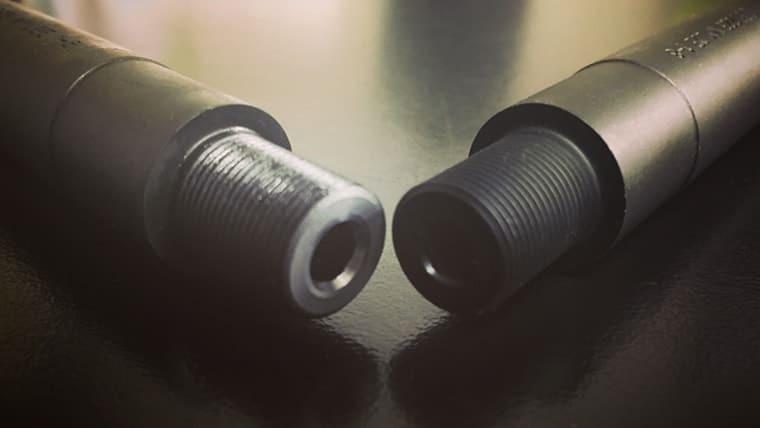 We typically bead blast our barrels prior to having them nitrided, creating a uniform matte black appearance upon completion. Bore uniformity remains as even and consistent with the salt bath nitriding process as that found with any match-grade stainless steel barrel. Through the nitriding process the material itself is hardened significantly, alleviating the requirement to apply a durable lining or protective finish. As with the chrome lining process, Criterion sought to fine tune this finishing process beyond what is typically found throughout the rest of the firearm industry. While each barrel is lapped prior to the salt bath nitriding process, they are also re-polished after nitriding to ensure a mirror-like internal surface in both the rifling and chamber. Accuracy of Criterion salt-bath nitrided barrels are on par with untreated match grade stainless-steel barrels. Enhanced durability and corrosion resistance also serve to significantly increase overall effective barrel life. When researching salt bath nitrided barrels it is not uncommon to come across a wide variety of reports on the varying level of performance you may see from barrels utilizing this treatment method. This is largely a result of how many manufacturers go about finishing their bore and chamber, as well as how the salt bath nitride process is executed. A number of budget barrel companies may make mistakes regarding when their barrel extensions are torqued into place during the manufacturing process, to what temperature the salt bath is held at during the nitriding process, or to how the internal surfaces are machined prior to the nitriding process. Criterion Barrels takes extreme care in ensuring that various measures are taken to enable consistent and reliable performance from our salt bath nitrided barrels. The salt bath nitriding process features a few benefits over pre-existing chrome lining technology. The nitriding process serves to enhance corrosion resistance on both the interior and exterior of the barrel. Chrome lined barrels are typically phosphate parkerized to protect the exterior steel from rusting, but this exterior finish does not offer the same level of corrosion resistance offered by the salt bath nitriding treatment. Salt bath nitriding can also be applied to individual custom stainless steel pre-fit barrel models, whereas chrome lining is typically limited to higher production volume stock model configurations. The ideal finish option will vary for each individual rifle build depending on the intended purpose and unique application of the rifle. Both treatment methods will serve to increase effective barrel life by many thousands of rounds when compared to their untreated counterparts. Historically the decision between finish options has been dictated by a choice between durability or accuracy potential. Thanks to modern advancements in barrel finish technology offered by Criterion Barrels, picking one or the other will no longer be necessary. This entry was posted in AR-15 & 308 AR, Articles, Technical Articles and tagged accurate chrome lined barrels, ar-15, Barrel Finishes, Best Barrel Finish, Best chrome lined barrel, Chrome Lining vs Salt Bath Nitride, chrome-lining, Match Grade Chrome Lined Barrels, Match Grade Nitrided Barrels, Precision Rifles, Salt Bath Nitriding, sub-moa chrome lined barrel.